Although it is officially May and should technically be warm out, this week has been some of the dreariest we've had in New York for a while. That being said, I do have some exciting news that you may have noticed. I changed the name of my blog!! This space is now officially called KATHERINE IN BROOKLYN. This change is something I have been wanting to do for a while and I'm so happy that I finally took the time to go through with it and give my site a small facelift. The name Katherine in Brooklyn reflects much more who I am as a person, a blogger, and someone who feels really at home where she lives. I know that I may not always live in Brooklyn, but this is where I created this blog and I feel like it perfectly captures my daily inspiration living in this big city. To me, Brooklyn is more than a geographical place - it's a place where I've learned more about myself, become more independent, developed a sense of the importance of travel, tasted new foods, and discovered my passions for cooking in my little apartment. I love the endless list of places to explore here, whether it's the food and entertainment scenes, outdoor space, or just aimlessly wandering around, and I wanted my blog to have a name that captured this. Brooklyn is a place that is constantly changing and I'm so happy to call it my home. I hope you enjoy the new space and name! To celebrate, enjoy some Grapefruit Rosemary popsicles! Mix grapefruit juice, lemon juice, water, sugar, salt, and Rosemary in a sauce pan and heat until warm but not boiling. 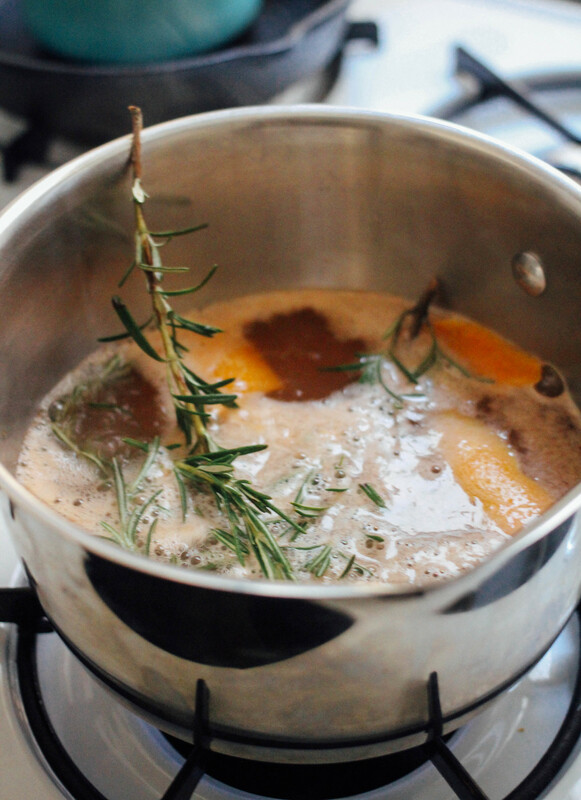 You want to make sure that the Rosemary infuses into the liquid. Let cool. Pour liquid into 6 popsicle molds about halfway up. Drop in some grapefruit chunks and freeze for one hour. Remove half filled molds from freezer and fill the rest of the way up with liquid. Add in some more chunks. Freeze for 30 minutes and add in popsicle sticks. Put back in the freezer and keep it there until frozen solid.